PHUKET: The annual Phuket Vegetarian Festival unofficially starts at sunset tonight with the raising of the go teng poles for the Jade Emperor and the Nine Emperor Gods to descend to our earthly realm. Each year, the Vegetarian Festival attracts thousands of tourists to Phuket to witness the various activities held across the island. Choor Su Gong Naka Shrine, 8am: Street procession in Phuket Town. Special parade at 4pm from Provincial Hall to Saphan Hin in honor of HM Bhumibol Adulyadej’s 84th birthday on December 5. The parade will conclude with a mass prayer and candle-lighting ceremony at Saphan Hin. Sapam Shrine, 7am: Street procession in Phuket Town. Tae Gun Shrine (Baan Nabon), 7am: Street procession in Chalong, Rawai and Karon. Lim Hu Tai Su Shrine (Samkong), 7:19am: Street procession in Phuket Town. Jang Ong Shrine (Opposite Vachira Phuket Hospital), 6:30am: Street procession in Phuket Town Village. CANCELLED: Kathu Shrine, 7am: Street procession to Patong Beach. Tae Gun Tai Tae Shrine (Baan Pasak), 7:15am: Street procession in Baan Pasak and Baan Don Market. Tha Reua Shrine, 7:30am: Street procession in Phuket Town. Choor Su Gong Naka Shrine, 2pm: Street procession in village. Sapam Shrine, 7pm: Street procession in Sapam Village. Cherng Talay Shrine, 7:30am: Street procession in Thalang District. Gim Tsu Ong Shrine (Baan Don), 7:30am: Street procession in Baan Don, Baan Kian, Baan Sakoo, Baan Nai Yang, Phuket International Airport and Muang Mai village in Thalang. Tha Reua Shrine, 6:30pm: Street procession in Thalang District. Yokkekeng Shrine, 7am: Street procession in Phuket Town. 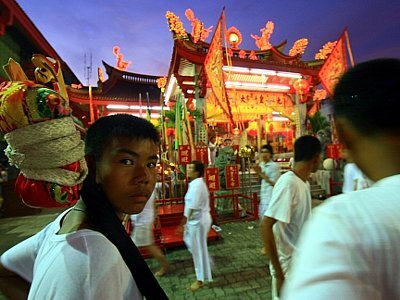 Sui Boon Tong Shrine (also called “Lor Rong Shrine“), 7am: Street procession in Phuket Town. Bangkoo Shrine, 3pm: Street procession in Sapam and Bangkoo villages. NOTE: All participating shrines stage street processions from their shrines to Saphan Hin on October 5 to take part in the “Grand Farewell” bonfire to send the gods heavenwards as the official closing ceremony of the festival. The processions, some of which start in the mid- to late afternoon, are scheduled to arrive in sequence at Saphan Hin between 11:45pm and midnight.